Interesting! So the 47 cap is doing double duty as the power filter cap and the charge pump's negative well cap? I think the datasheet shows a 10uF from pin 5 to ground, but I'd always use a filter cap anyway with a fuzz pedal, so I just included a single 47uF. I'm going to breadboard that soon and take some readings, compare to using the 10µF. You're correct, that pin 5 to ground 10µF cap is the well or output cap for the charge pump. Always nice to eliminate a component if you can. Awesome! Making this when I get back up and running! Used the AC128s and this thing sounds amazing! Thanks for the layout! Great stuff, no more daft polarity power supplies required! :o) Send me a pic if you get chance for the collection. 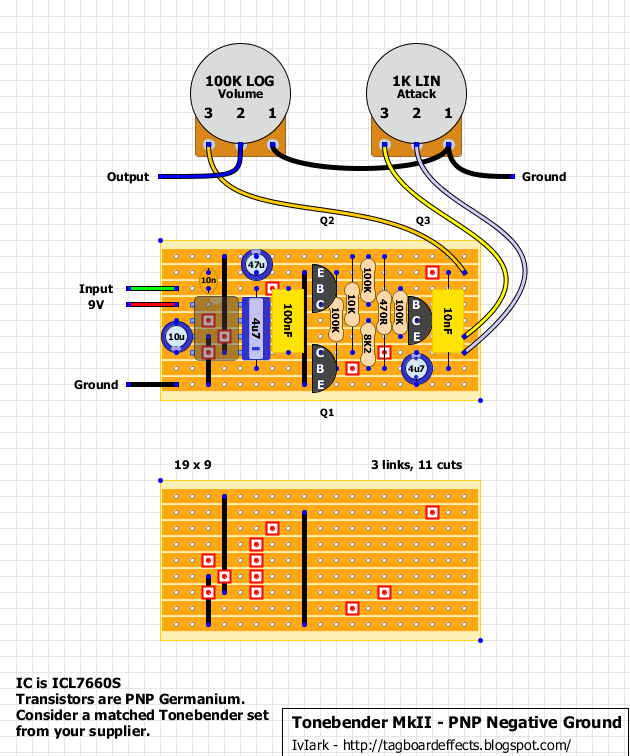 Hi Mark, I have been looking at this layout, and reading up on this circuit at fuzzcentral, one of the things I would like to do is add a trim pot so I can dial in the bias on Q3 correctly. I am going to build up two of these, I have some Tonbender matched OC75 from smallbear, and some 2n404 (I think) from somewhere that I might try as well. Two questions: First, do you think adding the trimpot is really necessary?? 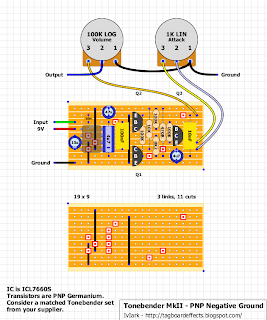 Second, to do that I would just replace the 8.2K with a trimpot wired as a variable resistor?? Is there other values I should be tweaking as well? Swap the 8K2 for a trimmer and yes 10K would probably be the best value. Solder 1 and 2 into the top and bottom resistor connections respectively, and ignore the third pin. Would a MAX1044SCPA work in place of the ICL7660S? Yes. Those are pretty much the same converters. i also used an external bias pot. very versatile and beautiful sustain. Nice jobs Tom, thanks again for the pics, they make good additions to my collection! i'm using a 7660scpaz and getting a weird low volume, high pitched squeel ONLY when the guitar's volume is all the way down? any ideas what could be causing this? I finished this one up, but unfortunately the volume is pretty low even when cranked all the way up. I tried the 470R to 1K mod, and it just became very noisy so I changed it back. Is there any other way to get more volume? It sounds like you wired in your volume pot with the wrong value, I did the same thing. I wired the 1k instead of the 100k because I had the pots installed in the unit and didn't realize the screw up until I fired her up. Here's some shots of my build. It's bigger than a standard Big Muff Pi. I just built the MkII and was getting some great tone until I noticed that it was a bit low on the volume. I'm using three different germanium caps - AC127, AC128, and a 2n388. Not to sound entirely stupid (I am new to building pedals) but, could that be the basis of my problem? Also, I'm using a B5k for the attack and A100k for the volume. Thanks, Souljah. I wrote the trannies wrong. I have a 187, 127, and the 388. I read that I could switch out the 470R resistor with a 1k to get more volume. I also have that B5k as the Attack knob. I'm looking at replacing it with a resistor just over 1k. Yeah. I'm red faced now. Can't believe I mixed that up. Probably fried the trannies. Thanks for the input though. oh man don't worry about it, these things happen, i did the same thing myself last week and the trannys were fine, you might still be alright, its all part of a learning curve, definitely give the mindbender a whirl. Is the little tab on the electrolytic caps negative? Here is my attempt on that build. So far no luck getting it to work. i'm getting a lot of noise on this considering i used shielded wire for the input and output. could it be the layout has the transistors too close to each other? well smallbear has agreed to send me a new set! so hopefully that fixes my problem! Had to re write this comment as I did several errors on my original build. - I strongly believe that the volume mod (1k-1k2 instead of 470r) and 20k trimpot instead of 8k2 resistor are a must. The output is really weak if you stick to GGG recomendations, and bias the Q3 collector at 4.5 volts. Once again, David Main is "the captain": Q3 collector should be biased from 7 to 9v volts. With this voltage, the output is greatly improved, and the sound gets more fuzzier and aggresive. - NEVER use a russian germ for Q1 or another low to none leaking trannie. If you do so, you'll get an overdrive sound, but not a fuzz. Besides, the sound will get flarty and dull with low attack settings. An about 200uA leaking, 50-70 germ will do the trick flawlessly. - If you bias the Q3 collect over 7 volts, you can forget too the GGG recomendation of using a 2k pot for Attack. By the way, my set of transistors: Q1 AC184 60hfe, 200ua leaking, Q2 GT308B 70hfe, no leaking, Q3 AC184 109 hfe, 90uA leaking. Q3 collector biased finally at 7,8v. Dialing in -4.5v is totally wrong, I measured my collector voltage at Q3 and it came in at -5.04v, and it sounded squishy, farty and compressed. After I installed a 10k pot, I dialed it in by ear and it no longer sounds the same, but, aggressive, more bottom end, richer. I uninstalled the pot to measure it, and it measured at 1.088k. Wow, the measured voltage installed on the collector of Q3 was 8.77v. Now I was in the ballpark. I decided to install a 2k pot permanently instead, I didn't want all that play in the bias knob, I didn't care for that farty squishy sound. It now has the qualities of the tonebender sound that I was chasing after. I posted a sound clip for sonic approval (enjoy my mediocre playing skills, put earmuffs on your cat or dog.) . The clip was recorded with a Classic Series '72 Telecaster Custom, into the pedal, into a THD tube amp, plus a touch of reverb. Transistors used are TUNGSRAM ac128 (66hfe, leak: .160mA) Q1, Russian 1t308B (79hfe , leak: .000mA) Q2, and lastly a NTE158 (120hfe, leak: .230mA) Q3. All measurements done by the Peak atlas DCA55. 1. BIAS THE TRANSISTORS PROPERLY! This is the most important thing. Q3 needs 7V or more and Q2 should be biased to taste also so It'll work correctly in conjunction with Q3. 2. This thing sounds the best (most loose and natural) if Q1 leaks like hell. Throw in your crappy trannies that leak too much (preferrably 70hfe or more) and swap the base resistor from 100K to 10K. 4. Sub the 470R for a 1-2K for more volume. I used 1K and I'm happy with it. Biasing the trannies hotter also helps with volume. Thanks man! I really like how it came out too. Well the thing is that I painted the bottom with a grainy texture silver sparkle/gray paint. I noticed that it isn't such a good Idea after all 'cause the texture will eat crraappplloooaads of lacquer. But a plain sparkle/flake or something that cuts through will do fine. The blacks are pen sprayed and the burst color is vintage amber mixed with brown. Just a dyed lacquer, no paint. And a finishing touch with a clear coat makes it look more 3D. Appreciate the info. I'll give a try on the next enclosure. Another great looking burst...I'm gonna get up the nerve to try that someday. Hi, I not boxed my yet, but it sounds great. I started to measure hfe in my transistors, and do not know if I'm doing something wrong, because at least I have a 90, then 100, 120, 140.150, 220, 310! Is it possible? I bought them once unused, AC128. I have not tested all yet, for now the best is 90 100 120, I only swap q3 for 220 and was too farty, but 330 was ok.
Maybe my meter is broken :) because everyone have hfe from 65 to 110? What are you using to measure them? You can't accurately measure germanium transistors with that kind of meter. You will need one that is designed to measure and take into account leakage to get accurate numbers. Something like the Peak DCA55 or DCA75 will do this. IC voltages look fine, as long as you're getting -9V on pin 5 it's performing its intended function. What are the transistor voltages? Ground wire is not in the 1st hole I just moved it but it's in the same strip so it should be ok right? I just replaced all the electrolitic caps and it started working for 20 seconds and then it made the same thing started making noise and suddenly just noise, i get pretty much the same readings on Ic and tranies maybe I should just try another brand of caps what do you suggest? Is the difference in voltage between pin 1 and 5 of the 7660 a possible indicator that they are not directly coupled (and therefore not engaging the boost function)? Oh wait.. That's 1 and 8. I biased mine by hear, using a pot soldered to the board, while playing with the gain and volume control. Checked the voltage later and it was ~6V. Oh yeah, one more circuit that needs to get boxed! I still don't have this boxed, so I got my Test Box and started playing with it once again. Took some measurements and Q3 voltage was exactly @ 7V lol I'm not sure if it's because we're in Summer here in the southern hemisphere or if I made some resistor change and can't remember (I have an 18K resistor going to Q3 C now). Anyway, this thing is animalesque as hell - loads of volume and thick fuzz. Actually, I can't tell much difference in fuzz with the gain control past noon or so (I'm one of those using a 2KB gain pot and a 1K resistor instead of 470R). Even with gain on "0" it's pretty fuzzy. Volume is plenty loud by the same 11-12:00 mark also (louder than both my Si and Ge fuzz faces). Still cleans well on those higher gain settings, especially considering the amount of fuzz this circuit puts out - possibly better than my Si fuzz face. I think my transistors were in the 70's - 90's - 120's range. Just built this. Very nice. I'll post some pics when I get it boxed. All MP20A. I probably can't trust my HFE measurements on my crappy multimeter, but I ended up choosing ones that read the standard recommended HFE. Biased a bit past 8v. Hey! I'm excited to build this pedal. I have ordered all the parts, and am 100% ready to go! It'll be my first build. I have a few questions first, regarding transistors. I ordered a matched OC77 set from Small Bear. I want to know how to put the transistors in, so that it's right. What pin where. Does it matter where I put which transistor, say Q1 in the Q3 spot, or does it not matter where, as long as they're matched? I don't want to blow anything up! awesome, and welcome. if you take a look at the layout you'll see on the transistors the letters C, B, E which stand for the legs of the transistor. C is for the collector, B for base, and E for emitter. i haven't ordered a set from smallbear, so i'm not sure if the legs will be marked so you'll know what leg is what. short answer is yes, it does matter what transistor goes in each position, and they should be marked which transistor is Q1, Q2, and Q3. if when you get them the legs aren't labeled, i believe the leg by the dot should be the collector, middle will be base, and the last will be the emitter. you can always post up later if you're unsure or need more help when you get them. my suggestion is to get some sockets so that you can easily install and remove the transistor, and not have to worry about burning them up when soldering. good luck buddy, and again welcome to the site. Do I just break off 3 little things from the 40? this way you can easily swap out IC's if you get a bad one, and it allows you to experiment with other IC's of the same type to see how it affects the circuit. and no problem buddy. glad to help. So built this the other day and it goes but I can't get it to clean up on the guitar volume. Also it has huge fuzz but crackles out if you let the note ring out (kind of fuzz factory gated sounds). Anyway I might get this to 'tone down'. Tried AC128's, AC132's, 2SB54's. Mostly the same outcome. Hello, hoping someone can help here. I built this and it's squealing on my test board. Also, the attack pot doesn't seem to be adjusting the gain as it should be. Any suggestions? I see a few others have had similar issues. What charge pump are you using? If you use a 7660 instead of a 7660S it will squeal. If the attack pot isn't working properly, you may need to try some different transistors, or you may have made a mistake in your build. Thanks, Travis. I was using the 7660SCPAZ from Tayda, but I switched is for a TC7660SCPA and the squeal is gone. I dont know what the deal is there, but it's working. The attack pot is also working now. Thanks for your help though! currently debugging one of these, when I use my audio probe the signal stops at the 10n, and I've replaced it twice now. What would be the obvious explanation for this? I have blown an Ic once already. Also when i measure the voltage coming out of the ic, none of the pins read negative. What does this mean? Hrum. I changed the 10n again, the audio probe isn't getting input though that capacitor. It seems to mysteriously stop at the opposite leg regardless of how many times I change the capacitor. The pedal Sounds fuzzfacy but with a quite high noise floor. If I touch the box or any Ground pin on the circuit or outboard the noise disapears and It Sounds very good actually. I changed the IC but the noise is the same. It isnt daisy chained. The power adaptar is visual Sounds 1 spot. Its good with other pedals. Just a quick question about Q3. Is the collector supposed to be in the middle instead of the base? Or is that a mistake? Nope. Its right, may have to twist the pins.